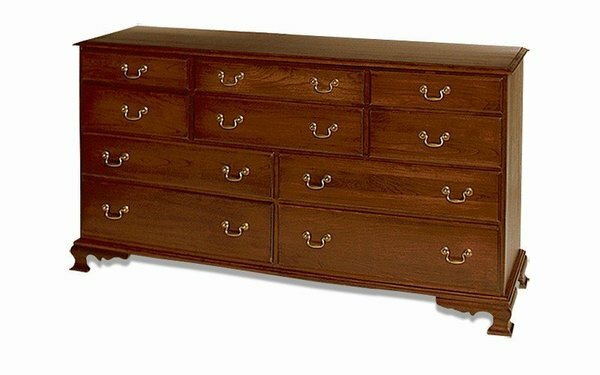 The Triple Amish Dresser was a staple of Early American times. With ten dovetailed drawers you will have plenty of space for all your clothes and linens. Detailed craftsmanship is displayed throughout, from the top of the dresser, to the feet. Choose your wood, finish, hardwood and drawer slides on this elegant dresser to get your order in the works. Please call one of our Amish furniture specialists with questions or to receive finish samples. After an order is placed we send out finish samples to confirm your selection. If you order online expect to receive these about 1 week after your order was placed. This item takes six to twelve weeks to be built. This solid construction Amish dresser will bring warmth and Colonial style into your master bedroom as soon as it is delivered!